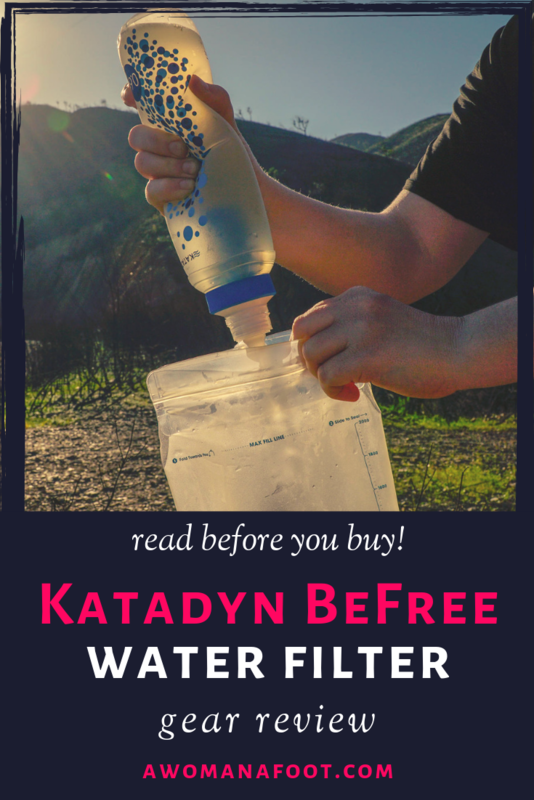 The Katadyn BeFree filtration system is a pretty recent purchase, but it has already managed to steal my heart. I am delighted I got it, and I can recommend it to everyone. But before I explain all the reasons why it's a great water filter, I want to clear a few things out. Do I even need a water filtration system for my trip? That depends on the length and style of your hike. For day hiking or multiple-day hiking from shelter to shelter it's not really necessary. But even on a day hike, it can get pretty useful. If you know there are natural water sources on your way, you can limit the amount of water you carry and refill during the day. This way you can hike with a lighter backpack. If you hike in a country that is known to have unsafe water - carry a small filter wherever you go, this way you limit the number of plastic bottles you purchase during your travels. I am sure we can agree that it is always a good thing! Additionally, it really helps with staying hydrated. We might cut on the amount of water to carry just to “save” on weight. A proper hydration during a hike is absolutely crucial, so we need to do whatever we can to make it easier to ourselves. To learn all you need to know about proper hydration in the Outdoors, read this article. What kind of filter do I need? Again - depends on the style of your hiking. If you hike alone, you will do fine with one of the smaller filters. When group or family travel is your thing, it might be prudent to grab something capable of filtering many liters of water efficiently. If the place you hike through has physically clean water (fresh streams) it might be a good idea just to grab purification tablets or drops to kill off bacteria or protozoa. If you know you will use your filter a lot and in very dirty, murky waters - better grab one of big guys. How to choose the best backpacking water filter﻿. You might also want to learn about the the difference between backpacking water filter vs. water purifier(MSR). Why is it so important to filter water? You might think that drinking directly from a mountain stream is the best thing ever, but I would advise being cautious. Unless you drink straight from where the flow starts, you never know what it carries. No matter what Slate says, we really should filter our water. If you hike through agricultural and rural areas, purifying water is a must, no matter how clean it might seem. If you don’t believe me, just imagine there is a chance of a dead animal up the stream or one peeing near it. Are you more willing to use filter now ;-)? 3) the need for caring a syringe to clean it. It served me well, but the time has come to upgrade to something that fixed all three problems. For a while, I've seen around reviews and comparisons of the new BeFree with other (including my mini-Sawyer) filtration systems. And there seemed to be a consensus: it's fantastic. So when I was getting ready for my trip to Portugal, I decided to buy it. And I am pleased I did. It removes protozoa and bacteria (like giardia & cryptosporidium) almost completely (99.9999%) and should filter up to 1000L (depending on water quality). It also clears any sediment and visible dirt. 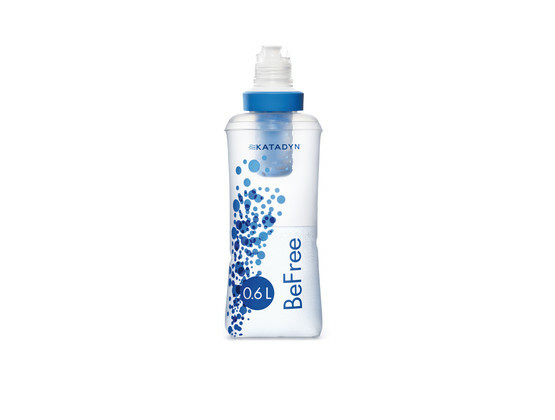 Katadyn BeFree folded and filter itself - easily removable and cleanable. Both images come from Katadyn.com. The size and weight. It's tiny, and the soft bottle rolls down, so it's basically the size of the filter. There is also no additional pieces for cleaning or storing. It’s really light, too. The wide mouth of the flask (42mm). Gathering water is straightforward. I used it to get water from standing shallow ponds or even puddles - no problem! The ease of the squeeze. Finally, my hand didn't hurt from squeezing the bottle! I was surprised how fast the water flows through the filter! This is probably the biggest plus - it's just so quick to filter and fill my water bladder or cooking pot. Ease of use. I could easily use and squeeze it with one hand, so the other could hold the water bladder. I didn’t need to use any extra strength, as it was the case with the mini-Sawyer, where I had to switch hands to squeeze the bottle because my hands were tiring easily. The bottle's material. The bottle is made of soft silicon-like material. My old filter had hard plastic which I could only roll to squeeze the water out and was worried it could break if squeezed wrongly. This soft flask is made by Hydrapak and is BPA-free, it seems very durable - just as my water bladder, also made by Hydrapak. Very easy to clean. No need for special equipment - it’s enough to just shake or swish in clean water. I really haven't found anything major yet. It's too early to say anything about its durability, but it does look excellent. The only element I might worry about is the cap. It opens using a plastic nozzle, the same as millions of plastic bottles ready for drinking from. I worry it might break off in the future, but I hope I'm wrong. The cost is acceptable. I've decided to buy the 0.6 L bottle - it was cheaper, and the size works fine for my needs. It’s delicate and although I did use it to clean filthy water from a puddle, that’s more of a rarity. I plan on using it in springs and rivers. Otherwise the filter might clog way too fast. The smallest flask I have is also the most delicate. I’ve read it punctures easily. I had no issues for now, and I hope it stays that way. The big flasks are said to be more durable. It does not remove viruses. The flip-cap might break and is not completely water-tight. The good thing is, it can be easily replaced with any soda cap. As you can see above, the water I used in that moment was far from perfect. It actually came from a nasty puddle. Hence the yucky brownish coloring. Yet, it filtered the water very fast. Some people might be annoyed with the wide mouth. What I find to be a big plus, if you want your filter to screw on your own bottle, you are in trouble. For me, it’s not an issue, as I use water bladder or carry extra water in a platypus collapsible flask, and don’t drink directly from the filter. If you hike in cold temperatures, you should look for a different type of a filtration system. The hollow fiber filters cannot freeze - it breaks them. There is also no way to know if the filter is OK or not. I don’t hike or camp when it’s below freezing, so I don’t mind. I am pleased with its performance and can highly recommend it to everyone! It’s tiny, ultralight, and still budget-friendly (although not cheap). For a bit more durability, it might worth buying the bigger flask - 1 L or 3 L, which is also better for hiking groups. It’s perfect for day- and multi-day hikes, bike trips, and any Outdoor adventures. For long thru-hikes and if you need filtration of very low-quality water - look for water filtration systems that are more robust and powerful. If that’s what you need - take a look below for a few examples. What kind of water purification method do you use? Are you happy with? Would you recommend it to others? Do you own the Katadyn BeFree? What do you think of it?